The sample photo shown here is a digital photograph (1280 x 960) of the quarry face to which has been added the burden data imported from the quarry face survey. It is not a 3D photo. Special software has been developed which automatically calculates the perspective of the photo so that burden data, processed in Blast Designer 32 can be imported and printed on to the photo to an accuracy of a few centimetres from the position measured with the laser profiler. The digital photograph complete with the burden annotations may be saved and printed. The single crosses are positioned above the collar location below each hole marker and the crosses with figures next to them show the position on the face measured with the laser profiler together with its associated burden value. This new software will also show the surveyed position of each hole relative to the burden data. This software supports multiple setups and has a zoom facility for closer viewing of danger areas in more detail. The combination of photo, burden data and hole position provides :- A visual check to ensure that any geological anomalies which could affect the blast have been identified and surveyed, such as the presence of cavities, clay bands, joint planes, bedding planes or discontinuities. 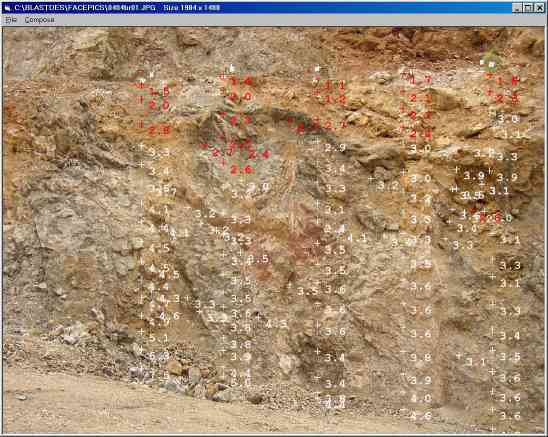 A permanent visual record of the face together with calculated survey data prior to blasting. Blast Designer 32 already includes video capture software so that a moving image of the blast can be viewed at normal speed or frame by frame for blast analysis. With the addition of DIBS, Blast Designer 32 provides a complete visual record of the blast survey. This includes :- Face survey with laser profiler PMS Impulse 100LR, either manually surveyed or auto scanned, hole deviation survey with Pulsar Blasthole Probe, calculation of burden data, print outs of each profile section with front view, overhead view with hole position and volume calculation, position of blast on national grid with ppv values, digital photo with record of laser burden values and hole position, hole charging record and video of the blast plus much more management information which is automatically generated from input data such as explosive usage costs. For further details please refer to Blast Designer 32 software specification. Face view survey points and burden design printout for hole 4.